NB: we're trying something a little different this month - instead of providing step by step photos, we ask that you click over to the inspiration tutorial since that is so well written. The link is at the bottom in a REALLY big font. 4 Scrappy fabrics for the arms of the x in the SAME color palette as your solid + shape - four different 3.5" squares to create a monochromatic look. 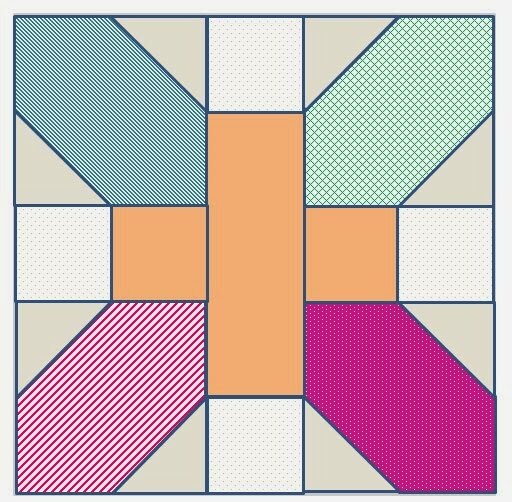 Begin by aligning one 2" background square onto of one 3.5" square, aligning the corners with right sides facing. Using a fabric marking pen and straight edge, draw a straight line for corner to corner on your small background fabric square. Sew directly on the line you traced. Trim away the outer edge, leaving 1/4" for seam allowance. Press open and repeat for the opposite corner. Repeat steps 1-5 until you have 4. 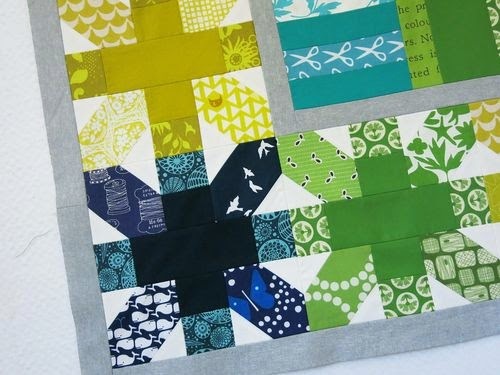 Sew a solid color 2” square to a printed 2” square. Repeat to make two pairs. Sew your printed 2” squares on the short ends of your solid color rectangle. Sew together all the parts as so it looks like the diagram. Your block will be 8" unfinished. And as always, one block garners you one lotto ticket to win the whole batch. Make one, make five! See you next month!